What is the InformationWeek 500? This is InformationWeek's 25th year ranking the country's most innovative users of business technology. The InformationWeek 500 tracks the IT practices of the nation's most innovative IT organizations, providing a unique opportunity to understand and examine the business practices of these firms across core areas of operations, including, technology deployment, IT budgets, business-technology infrastructure, and IT strategies. When does the application period open and close? The application period for the 2013 InformationWeek 500 opens in December 2012 and closes April 12, 2013. The criteria used in the selection process are determined by InformationWeek editors. To make the list, a company must demonstrate a pattern of technological, procedural, and organizational innovation. Only organizations with $250 million or more in annual revenue may participate in the study (a company may also qualify if they are a subsidiary of a parent company with revenue of $250 million or more). The InformationWeek 500 examines the technology strategies and initiatives of companies across 22 industries (including higher education). U.S. government agencies can pre-qualify to participate in our 2013 InformationWeek Government IT Innovators program here.  Be honored at the 2013 InformationWeek Conference and Awards Gala, September 8-10, 2013 at the Montelucia Resort & Spa, Scottsdale, Ariz. Information on the event will be available at http://informationweekconference.com/. The top five companies will be profiled in the 2013 InformationWeek 500 issue and on the site, and they'll be featured in a special InformationWeek 500 Report. We will also honor those companies selected at the top of their industries, as well as the organizations demonstrating the most innovative uses of technology in the essay portion of the application. Don't miss this opportunity for your company to receive the distinct honor of being recognized as one of the America's most innovative users of information technology. No, there is no cost associated with submitting an application. Companies must pre-register for the 2013 InformationWeek 500 by completing a short online form at: http://www.surveygizmo.com/s3/1009971/2013IW500pre-reg?iwid=RC. If an organization qualifies, a follow-up email will be sent with a link to an application which can be completed entirely online. This comprehensive survey, written by InformationWeek editors, is used to identify the InformationWeek 500. The application is finely focused on measuring the strategies and initiatives at the core of business technology innovation. Companies can access InformationWeek 500 Application Tips to guide them through the process. The application can be completed over a period of multiple sessions. Click on the "Save and Continue" link located in the top right-hand corner of the online application to save your progress. An editing link (which will differ from the link included in your original email invitation) will be emailed to you. Bookmark this link in your browser to access your saved application. If you lose the editing link, please email [email protected] and it will be re-sent to you. Why should I complete the essay? We strongly recommend that you take time to complete the brief essay question that is a part of this year's InformationWeek 500 qualifying application. It offers an opportunity to tell us about initiatives that may not otherwise be referenced in the survey. It also provides the opportunity for your company to be recognized for specific achievements for key initiatives conducted by your IT organization in the past 12 months. Organizations that submit this essay are more likely to score higher in the InformationWeek 500. Will my company's information be disclosed? Although InformationWeek 500 candidates reveal key elements of IT spending plans and budgets during the research process, the data is aggregated by industry and individual responses are never disclosed. Nor do we disclose individual contact information of participants to third parties or to companies not directly involved in the InformationWeek 500 study. When will I find out whether or not my company made the list? If your company is among the 500 companies to make this year's InformationWeek 500 list, an email alert containing pertinent information on your company will be forwarded in July to confirm the accuracy of the information gathered. At the same time, it is possible that you might receive telephone calls and emails from InformationWeek reporters interested in interviewing members of your senior staff for the InformationWeek 500 issue. What if my company doesn't make the list? The InformationWeek 500 is a very competitive study and only 500 companies can make the final listing. However, if your company demonstrates a pattern of technological, procedural, and organizational innovation, it is possible it will be featured in InformationWeek after the InformationWeek 500 publishes. When will the 2013 InformationWeek 500 companies be publicly announced? The InformationWeek 500 will be honored at the 2013 InformationWeek Conference and Awards Gala, September 8-10, 2013. The full list of winners will appear both in the 2013 InformationWeek 500 issue and online at informationweek.com/500. Executive Alliance is the creator and provider of premium leadership-recognition forums that honor and celebrate outstanding achievement of executives in different industries. InformationWeek has partnered with Executive Alliance on the program management for the InformationWeek 500 since 2006. You may receive messages and phone calls directly from Executive Alliance. Executive Alliance will also be notifying companies making the 2013 InformationWeek 500 list and verifying information appearing in print and online. Where can I go with questions or for more information? 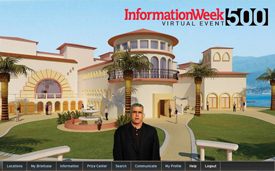 InformationWeek offers a way to get answers to your InformationWeek 500 questions. We welcome your inquiries by email at [email protected]. Please include your name, company name, and day-time telephone phone number on all communications. All queries will be handled as quickly as possible. Consider [email protected] as your direct link to the editors and researchers behind the InformationWeek 500. You can submit any questions you have about this year's study using [email protected]. This year InformationWeek is partnering with Executive Alliance on the survey program management, so you may receive messages and phone calls directly from Executive Alliance. All queries will be handled as quickly as possible. Simply email us at [email protected]. To speak with someone directly, please call Executive Alliance at 678-445-1919. Where can I find lists of winners and editorial content from the 2012 InformationWeek 500? You can access the complete editorial coverage of the 2012 InformationWeek 500 at informationweek.com/500. My company was a 2012 InformationWeek 500 winner. Who do I contact about logo use, ordering awards, ordering reprints, etc.? You can contact our partner, Wright's Media, directly.